NEW DELHI: Indraprastha Gas (IGL) has raised the prices of compressed natural gas (CNG) by Rs 1.36 per kg in Delhi and Rs 1.55 per kg in Noida, Greater Noida and Ghaziabad, citing rupee appreciation and changes in gas allocation policy. Prices of piped natural gas for domestic use remain unchanged. 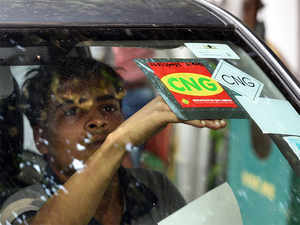 CNG, used by motorists, will now cost Rs 41.97 per kg in Delhi and Rs 48.60 per kg in Noida, Greater Noida & Ghaziabad. The CNG price rise comes amid a sharp rise in the rates of petrol and die sel, the primarily fuel used for transport. An increase in rates by IGL may soon get replicated by other city gas companies. âThere has been a steep appreciation of the dollar as compared to rupee since the last CNG price revision. The base price of natural gas being procured by IGL from its sources is dollar linked thereby making the entire input price totally dependent on price of dollar vis-Ã -vis rupee,â IGL said in a statement. The proportion of costlier gas has been increased in the domestic gas pie available for supply as CNG, necessitating a price rise, the company further said. For autos, the increase would be 4 paisa per km, for taxi it would be 7 paisa per km and in case of buses, the increase would be nearly 40 paise per km, the company said.